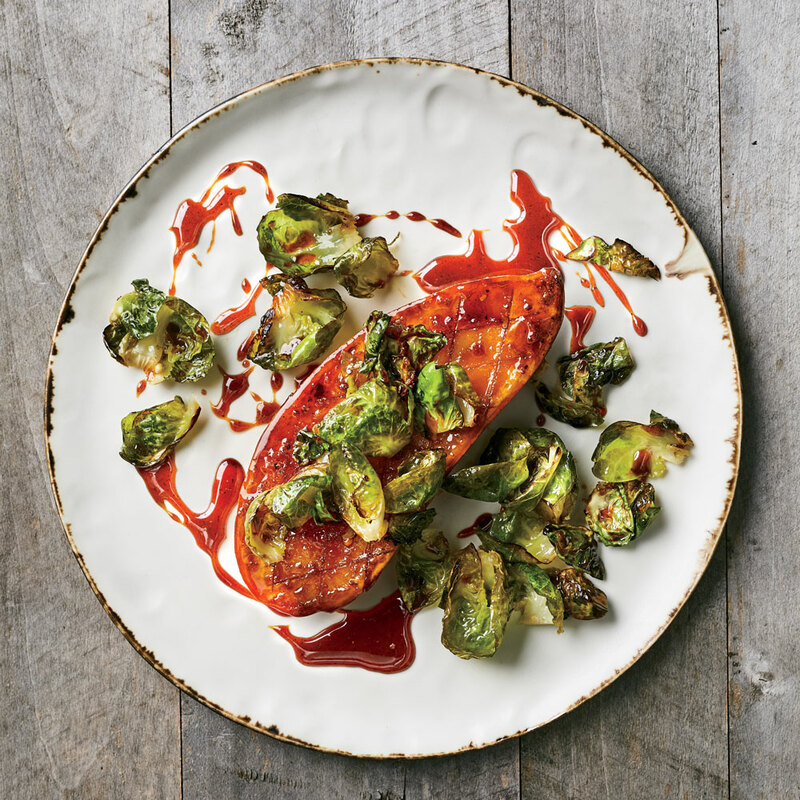 Be sure to use a cast-iron skillet for this recipe; it maintains heat and will result in beautifully caramelized honey and well-cooked brussels sprouts. If you’re in a hurry, don’t worry about separating their leaves—the dish will still taste great. Preheat oven to 400°F. Cut sweet potato lengthwise into 1/2-inch-thick slabs. Place the 2 center-cut potato slabs on a cutting board; reserve remaining sweet potato pieces for another use. Score 1 side of each slab in an 1/8-inch-deep diamond pattern. Stir together ginger, 1 teaspoon salt, coriander, and fish pepper flakes in a small bowl. Rub mixture evenly on sweet potato slabs. Heat a large cast-iron skillet over high until smoking, about 3 minutes. Add oil, and swirl to coat bottom of skillet. Add sweet potatoes, scored side down, and cook until bottoms are golden brown, about 1 minute. Flip and arrange brussels sprouts, cut sides down, in a single layer around sweet potatoes. Drizzle with 2 tablespoons honey; transfer skillet to preheated oven. Roast until sprouts are tender and cut sides are caramelized, 12 to 15 minutes. Remove sprouts from skillet, and sprinkle with 1/4 teaspoon salt. Return skillet to oven; roast at 400°F until sweet potatoes are tender, 5 to 8 minutes. Meanwhile, carefully separate brussels sprouts leaves, trimming stem ends if needed. Set aside. Remove skillet from oven, and drizzle sweet potatoes with remaining 1/4 cup honey. Tilt skillet, and baste sweet potatoes until honey caramelizes and sweet potatoes are glazed, 2 to 3 minutes. Transfer sweet potato steaks to serving plates. Sprinkle with remaining 1/4 teaspoon salt, and drizzle with remaining caramelized honey in skillet. Top with brussels sprout leaves.